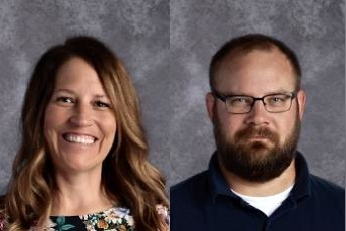 Manhattan-Ogden USD 383 announced its two teachers of the year for 2019-2020 in a Friday release. Woodrow Wilson Elementary School teacher Kelly Carmody and Manhattan High School teacher Noah Busch are the recipients and will be the USD 383 representatives in the Kansas Teacher of the Year program as well. Carmody teaches 6th grade and has been with the district for eight years. She received a social science bachelor’s degree from Kansas State University, as well as a master’s in elementary education from Pacific University and a master’s in special education from K-State. Busch teaches 9th grade science and has been with the district for seven years. He received his bachelor’s degree in education from Emporia State and his master’s in environmental studies from Friends University. The Kansas Department of Education sponsors the Kansas Teacher of the Year program. Each school district is permitted two nominations — one elementary teacher and one secondary school teacher. Nominees also must be full-time teachers in a state-approved or accredited school. The post Wilson, MHS teachers named USD 383 teachers of the year appeared first on News Radio KMAN.